One specialist who is becoming very well known in Pattaya is Dr. Somchai Trakoolshokesatian, the ophthalmologist from the Bangkok-Pattaya Hospital. He is dedicated to helping people to see, using new surgical techniques, so I suppose that he could be called a doctor with a vision! He was born in Nakhon Sawan, of Thai-Chinese parents. “We were very poor,” said Dr. Somchai. “My father was a labourer, and my mother had a small shop in the village.” Fortunately, or perhaps with foresight, his parents were satisfied with just one child, as family finances were not good. He did well at the local government schools, mixing his studies with helping his mother in the shop, or going with his father to assist him in any way that he could. During this time, his interest in art became very strong and he ventured to his parents that he would like to study to become an artist. However, his parents were hoping that their only son would take another direction in life. 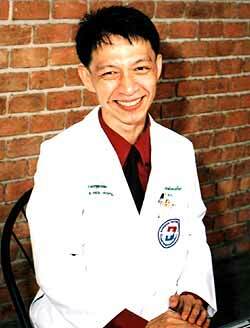 “The dream of all Thai-Chinese families is for their children to become doctors. It was my parent’s dream.” So like all good Thai-Chinese sons, Somchai Trakoolshokesatian went to university to study medicine. The fees were not too expensive at Chiang Mai University, and he went there for six years to study for his basic degree. In return for government assistance young doctors become indentured and must serve three years in a public hospital. For Dr. Somchai, this was to be in Tak province, close to the Burmese border. “We saw lots of Burmese Hill Tribe people, and held clinics for them, like an extension of the hospital.” These out-patient clinics were a three day walk with elephants! “We could not ride the elephants, they carried the medicines and equipment.” Looking at the decidedly non-muscular Dr. Somchai, it is hard to imagine this man trekking through the jungles, but he did. There was another reason too. “Eye surgery is very delicate work. Many doctors are scared of the very delicate nature of it. It’s close to being art work,” said Dr. Somchai by explanation. After another three years at Chiang Mai University, he become a licensed Eye Specialist, certified by the Board of Ophthalmology in 1994. An amazing scenario then emerged. Here was Dr. Somchai, with his shiny new certificate, but there were no positions vacant for newly qualified ophthalmologists at any of the government hospitals. Eventually there was a vacancy in a hospital in Rayong which he took. Three months later the hospital closed, and the new ophthalmologist was unemployed again! A friend of his opened a polyclinic and asked him to help him out, working as a general surgeon/GP/physician for the next 12 months. This was not what he wanted to do, but at least it kept some money coming in. This was necessary, as by this stage he had married and had one son to rear. However, in 1996, the Bangkok-Pattaya Hospital was looking for a resident ophthalmologist, and Dr. Somchai, wife and son moved to Pattaya. Now fully employed in his own specialty, he was very interested in refractive surgery. It was the artistry that he had always leaned towards, and he could combine his artistic skills with the demands of eye surgery. LASIK became the new way to correct refractive errors and Dr. Somchai went to Antwerp, Belgium to do the international course in Refractive Laser Surgery. He followed this up, the following year, with the international course in Refractive Surgery (Akkommodative-1CU) in Munich, Germany. This was to learn the very latest techniques in implantation of Intra Ocular Lenses (IOLs). It was here that he began to formulate his own ideas, and could see that one very important factor was to select the right lens for the differing eyes of the patient’s. This required extreme accuracy in pre-operation measurements. He visited the company in Germany that was making IOLs and discussed the calculations and formulae that were being used. He returned to Thailand and began to develop a system by which his accurate measurements were then followed by insertion of an IOL that could be focussed, using the patients own ciliary muscles (small muscles in the eye that are used to change the focal length of the normal lens). The end result was a lens that acted like a normal one, able to see distance, but still could be focussed close up, to make reading glasses no longer needed. “I had to change the point of view to be that of the patient, rather than that of the doctor.” In this way he could begin to see (sorry about the pun) the needs of the patients and adapt the methods to assist them. He called his system “SuperSight” and is now the leading surgeon in the world using the special German lenses, implanting 90 percent of the companies output. Now his SuperSight takes up even more than 90 percent of his time, both at work and at home. His relaxation is watching videos of his surgery, looking to see what he might be able to improve. I asked him if SuperSight were now an obsession and Dr. Somchai stopped for a minute before answering. “This makes me sad. Everyone around me, and my family, helps me. What am I doing for them?” That is a question that only Dr. Somchai can answer, with his family now one more with a two week old daughter, but the testimonials he receives from happy patients shows what he is doing for some of the world’s visually impaired is very much appreciated. Dr. Somchai Trakoolshokesatian, the eye artist, is a remarkable man.